Umbrello 2.27 releases are available as part of the KDE Applications 18.12 releases. See new Umbrello 2.27 features for a list of new features and Umbrello 2.27 fixed bugs to see the list of fixed bugs in this releases. Binary packages are available from related Linux distributions and for 32bit and 64 bit Windows from the KDE download mirror network. Umbrello 2.26 releases are available as part of the KDE Applications 18.08 releases. See new Umbrello 2.26 features for a list of new features and Umbrello 2.26 fixed bugs to see the list of fixed bugs in this releases. Umbrello 2.25 releases are available as part of the KDE Applications 18.04 releases. See new Umbrello 2.25 features for a list of new features and Umbrello 2.25 fixed bugs to see the list of fixed bugs in this releases. Umbrello 2.24 releases are available as part of the KDE Applications 17.12 releases. See new Umbrello 2.24 features for a list of new features and Umbrello 2.24 fixed bugs to see the list of fixed bugs in this releases. Umbrello 2.23 releases are available as part of the KDE Applications 17.08 releases. See new Umbrello 2.23 features for a list of new features and Umbrello 2.23 fixed bugs to see the list of fixed bugs in this releases. Umbrello 2.22 releases are available as part of the KDE Applications 17.04 releases. See new Umbrello 2.22 features for a list of new features and Umbrello 2.22 fixed bugs to see the list of fixed bugs in this releases. Umbrello 2.21 releases are available as part of the KDE Applications 16.12 releases. See new Umbrello 2.21 features for a list of new features and Umbrello 2.21 fixed bugs to see the list of fixed bugs in this releases. Umbrello 2.20 releases are available as part of the KDE Applications 16.08 releases. See new Umbrello 2.20 features for a list of new features and Umbrello 2.20 fixed bugs to see the list of fixed bugs in this releases. Umbrello 2.19 releases are available as part of the KDE Applications 16.04 releases. See new Umbrello 2.19 features for a list of new features and Umbrello 2.19 fixed bugs to see the list of fixed bugs in this releases. Umbrello 2.18 releases are available as part of the KDE Applications 15.12 releases. See new Umbrello 2.18 features for a list of new features and Umbrello 2.18 fixed bugs to see the list of fixed bugs in this releases. Starting with umbrello version 2.17.0 binary packages of umbrello for 32bit and 64 bit Windows are available and could be downloaded from the KDE download mirror network. The binaries has been build on the OpenSUSE build service using GNU cross compilers. Many thanks to Ralf Habacker, who organized the build system and provided the binary packages. Umbrello 2.17 releases are available as part of the KDE Applications 15.08 releases. See new Umbrello 2.17 features for a list of new features and Umbrello 2.17 fixed bugs to see the list of fixed bugs in this releases. Umbrello supports MySQL and PostgreSQL export since a long time. With the upcoming umbrello 2.17 release (KDE Applications 15.08) umbrello also gets support for importing MySQL and PostgreSQL schema, which enables round trip engineering. Many thanks to Ralf Habacker, who added this feature. In the last weeks the port to KDE frameworks 5 has been merged back into the master branch. Many thanks to Andi Fischer, who ported umbrello to KF5 and Ralf Habacker, who merged back the changes into the master branch. The merge back has been designed to support KDE4 and KF5 builds from the same source. To create a KF5/Qt5 based build -DBUILD_KF5=1 has to be added to the cmake command line. Umbrello 2.16 releases are available as part of the KDE Applications 15.04 releases. See new Umbrello 2.16 features for a list of new features and Umbrello 2.16 fixed bugs to see the list of fixed bugs in this releases. Umbrello 2.15 releases are available as part of the KDE Applications 14.12 releases. See new Umbrello 2.15 features for a list of new features and Umbrello 2.15 fixed bugs to see the list of fixed bugs in this releases. Today Wolfgang Bauer started to build umbrello binary packages from the umbrello frameworks git branch for opensuse, which makes it possible to follow the porting process very easy. Bug reports and/or patches are wery welcome and should be reported through the KDE bug tracker. Umbrello has been registered as coverity project, which helps to increase the code quality. High impact issues from the source code scan has been already fixed by Oliver Kellog, for the remaining detects volunteers are welcome. If you want to help to improve the code quality of umbrello, please contact Oliver. Today Andi Fisher started the port of umbrello to KDE frameworks 5. He expects to be ready in January 2015. Umbrello 2.14 releases are available as part of the KDE Applications 4.14 releases. See new Umbrello 2.14 features for a list of new features and Umbrello 2.14 fixed bugs to see the list of fixed bugs in this releases. Umbrello now supports importing the UML model from a zipped XML project file using the *.zargo file extension, which is used for example by ArgoUML and Poseidon for UML. A zipped XML project file contains an UML model (in XMI format), diagrams and project informations. Over the past twelve months, 18 developers contributed to Umbrello UML Modeller. This project has a relatively large team, in the top 10% of all project teams on OpenHub. For this measurement, OpenHub considers only recent changes to the code. Over the entire history of the project, 115 developers have contributed. See the full story here. Umbrello 2.13 releases are available as part of the KDE Applications 4.13 releases. See new Umbrello 2.13 features for a list of new features and Umbrello 2.13 fixed bugs to see the list of fixed bugs in this releases. Ralf Habacker committed today this new feature. Many thanks for this contribution. Joris Steyn added today a new diagram duplication feature. This feature has been made possible after Joris fixed several bugs in the copy & paste code and the undo implementation. Umbrello developers now can use umbrello api documentation inside Qt Creator. Download umbrello-4.12.qch and install it in Qt Creator. Ralf Habacker committed today a new feature for sequence diagrams. Sequence diagram messages could have sequence numbers to indicate the ordering. The dialog for message adding has now a new 'autoincrement' checkbox, with which an automatically increment of the sequence number could be enabled. The implementation of Bug 107174 is now mostly finished; the remaining bugs will be fixed in the next time. The implementation of Bug 107174, has been started several weeks ago. Now thanks to the efforts of Andi Fischer and bug fixing by Ralf Habacker step 1 and 2 of the implementation plan has been finished and is merged to git master. Ralf Habacker adds a graphical indicator to graphical widgets, which has documentation. This feature, which is useful to get a quick overview what is documentated and what not, is enabled by an entry in the diagram context menu and if enabled, displays a triangle in the lower left corner of the related widget. The implementation of Bug 107174, has been started by Andi Fischer. The umbrello website has been migrated to the KDE infrastructure and the capacity website framework. This year about 150 umbrello bugs has been fixed. This let umbrello be run much more stable. Today a new resize context menu feature has been added by Ralf Habacker. Today umbrello got support for exporting diagrams as dot files by Ralf Habacker. This has been made possible by the auto layout feature which has been implemented a week ago. Umbrello got a new diagram auto layout feature from Ralf Habacker. It uses graph generators from the graphviz package which is included in many linux distributions and is also be available on windows. The auto layout feature is available through entries of a diagram context menu. For each diagram type there are multiple layout types available, which are customizable using configuration files. For an example see Vertical layout for class diagrams. 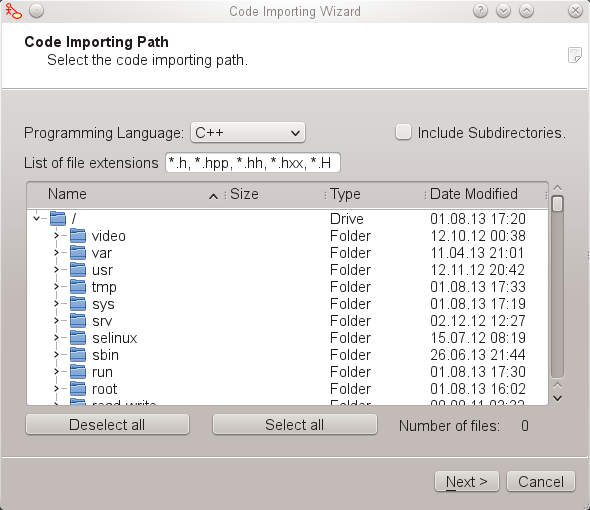 Andi Fischer committed a new code import wizard, which makes it able to select whole directory structures and/or single files. Several years have gone by while Andi Fischer and Ralf Habacker have been merging the Umbrello GSOC-2008 branch back into trunk. Ralf today committed the QGraphicsScene and QGraphicsView changeover of UMLView and UMLScene. This completes the bulk of the merge. Cheers to Andi and Ralf for their untiring efforts! This year about 35 umbrello bugs has been fixed. Camila Ayres is working on porting Umbrello to QGraphicsView, keep up to date on her blog. Gopala Krishna is implementing some exciting improvements as part of his Google Summer of Code project. His work is currently happening in a branch but will soon be merged to the trunk. Stay tuned. The Register has reviewed some UML tools and describes Umbrello as "a nice, clean and simple UML editor". At the KDE 4.0 Release Event Umbrello was spotted running on both Windows and Mac OS X. These ports of KDE apps are not yet stable but you can follow progress on windows.kde.org and KDE on Mac wiki page. Umbrello 2.0 has been released as part of the kdesdk module in KDE 4. Thanks to our contributors Oliver, Sharan, Andi and others for their work on this milestone. Install it from your distro as part of kdesdk. Umbrello 1.5.8 has been released. Umbrello 1.5.71 has been released. 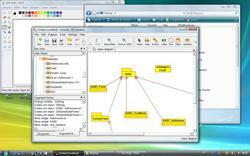 IT Managers Journal has an introduction to UML which uses Umbrello as the example application. Umbrello 1.5.7 has been released. The students from Toulouse's ISI university have merged their work into trunk, including improved undo support. We now have a student from Google's Summer of Code programme who will work on improving Entity Relationship diagram support. Our developers page has added mysql2xmi.sh a script to convert mysqldump table data to an Umbrello XMI file, from Benjamín Díaz. A university programme to get students working on real code in Free Software programmes has chosen Umbrello as one of its development projects for one of its teams. The students have set up an Umbrello wiki in French with their plans form working on Umbrello in KDE 4. Umbrello 1.5.52 has been released. Umbrello 1.5.51 has been released. Umbrello is looking healthy on KDE 4. Join us on umbrello-devel if you want to help out. Umbrello 1.5.4 has been released along with KDE 3.5.4. Thanks to a few ardent volunteers, Umbrello makes its debut on Qt4 / KDE4 - but there is still a lot to do. ARgenerator can be used to generate ActiveRecord Models from Umbrello diagrams. xmi_reverse.pl is a standalone Perl program to import Perl into Umbrello's XMI file format. See Developer's page. Use Umbrello? Add the Umbrello brilliant button to your blog or website to spread the meme. Umbrello 1.5.3 has been released along with KDE 3.5.3. Umbrello 1.5.2 has been released along with KDE 3.5.2. Umbrello 1.5.1 has been released along with KDE 3.5.1. Umbrello 1.5 has been released along with KDE 3.5. Umbrello 1.4.3 has been released along with KDE 3.4.3. Packages are available as part of Kubuntu Breezy and other distributions. Umbrello 1.4.2 has been released along with KDE 3.4.2. Umbrello 1.4.1 has been released along with KDE 3.4.1..
KDE-Files.org has launched today as a community website for sharing templates and example files. It incluedes a category for Umbrello files. Please upload sample files and any UML diagrams you can spare so others can learn from your UML techniques. Umbrello 1.4.0 has been released along with KDE 3.4.0. Robin Rawson-Tetley has written Java 2 XMI, a Java programme to import Java into Umbrello's XMI file format. Umbrello 1.4.0-beta2 has been released for testing along with KDE 3.4.0-beta2. Jay Snyder has compiled Umbrello for Cygwin. Umbrello 1.4.0-beta1 has been released for testing along with KDE 3.4.0-beta1. Umbrello 1.3.2 has been released along with KDE 3.3.2 and Umbrello 1.4.0-alpha1 has been released for testing along with KDE 3.4.0-alpha1. Umbrello 1.3.1 has been released along with KDE 3.3.1. Umbrello 1.3.0 has been released. This version comes with KDE 3.3. This release of Umbrello features improved memory management for large diagrams, tools for aligning objects, compressed XMI file support, new icons and better XMI standard conformance. Umbrello 1.3 beta is the version from KDE 3.2 beta 2. Umbrello UML Modeller 1.2.1 has been released with KDE 3.2.1. This fixes several important issues with 1.2. A source package for KDE 3.1 is available. Umbrello 1.2 is the result of a hard year's work by a dedicated team of developers. New features include improved code generation in more languages, undo/redo, a resizeable and zoomable canvas and more diagram types. It is part of KDE 3.2.